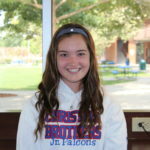 You are here: Home \ Falcon Sports \ Featured Posts \ So You Think You Can Cheer? Friday night football lights, pleated skirts, pom poms, and megaphones all come to mind when one thinks of a cheerleader. A sideline cheerleader that is. Most people think that cheerleading “isn’t a sport” or that the work they do is “easy”. But what most people don’t know is that there is a whole other side of cheerleading known as competitive cheer. What makes a competitive cheerleader? Posh ponies, flashy make up, high intensity routines? There is so much more to the world of cheerleading then meets the eye. 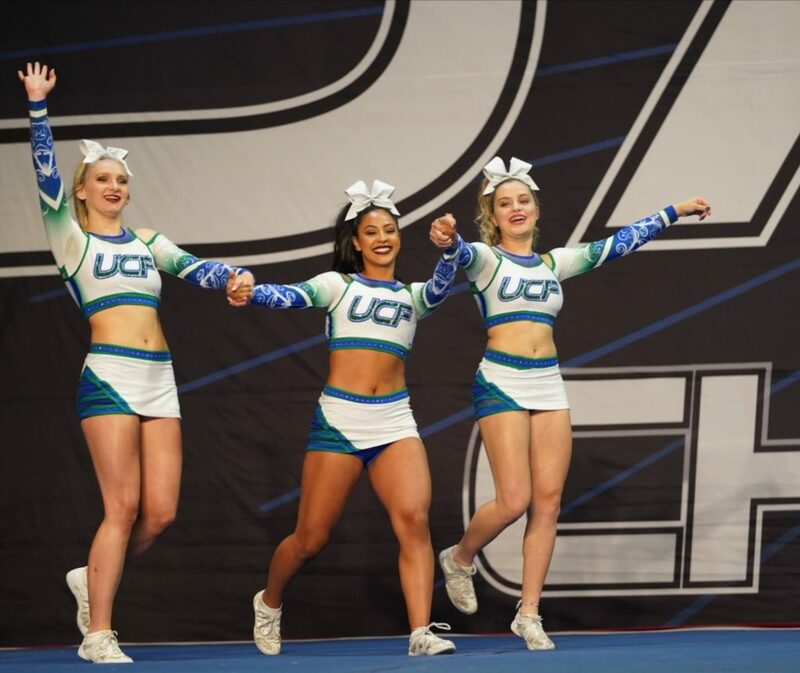 Competitive cheer for most athletes consists of practice two to three times a week, tumbling classes twice a week, as well as conditioning and stunt clinics. The grind continues with two-day competitions once a month where gyms compete against teams from all over the country. Competitive cheer is broken down into five levels and five divisions based on age, tumbling, and stunt abilities. Divisions are based mainly upon age — Senior, Junior, Youth, Minis, and Tinies. Levels get much more complicated and are mainly dependent on one’s tumbling ability. The difficulty of stunting, tumbling, and competitiveness increases with each new level. Level 1 has no requirements for tumbling, 2 requires a back handspring, 3 requires tuck and punch fronts, 4 is a layout and 5 is a full. Katie smiling as she soars through the air at Summit, the annual national championships in Orlando. 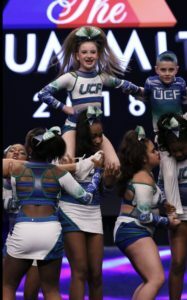 Katie Littlejohn, an 11 year old 5th grader and two year competitive cheerleader for the Elk Grove-based University Cheer Force Junior 2 Frost team explains that she chose comp cheer for the sole reason of wanting a more competitive cheer experience. “I’ve been cheering for five years, and I wanted more of the comp experience with the hair, the makeup, and the competitions,” she says. She had been doing sideline cheer her entire life and stressed that “sideline cheer is more about doing cheers and cheering on the football players where as cheering for a gym is more about cheering for yourself”. Unlike Katie, CB senior Svetlana (Svet) Parfenova (’19) is a competitive cheerleading veteran and has been cheering for UCF for five years and is now a member of Black Ice Senior 3. To Svet, competitive cheer is not just about the flashy make up and high intensity routines. “I like competing, making friends, and traveling to new places” she says. Competitive cheer means many different things to different people, but for Svet, one of the most challenging aspects to cheer is missing out on a social life. Since Katie is so young and hasn’t experienced Homecoming or Prom yet so she finds another side of competitive cheer more difficult for her. Katie’s struggle is more position-orientated because being a flyer [the girls who are thrown into the air] comes with extra work to be able to maintain her position. Svet and her team Black Ice successful nailed their pyramid sequence. “There are a lot of different flyers in my gym, so it’s difficult to keep my spot,” she says. “I am constantly working to be the most flexible, have the most skills, best facials and sharpest motions just so I can keep my spot”. Comp cheer is not as easy as it looks and requires a huge commitment. It is good for those who want to “invest in one sport” Katie says. Comp cheer consists of private and group flying and tumbling classes, and if you miss a practice, then one risks being kicked off the team. But it also has plenty of upsides. Out of all the aspects of competitive cheer, Katie enjoys competitions the most. “My favorite part [about comp cheer] when you hit your routine and you know you nailed it. That feeling you get is like no other — it’s such a thrill” she says. For Svet, the best thing about competitive cheer is bonding with her teammates. “I think my team is really strong this year and we have a really good bond, which some teams just don’t have,” she says. “We just have this really good connection which some teams don’t get so I can’t wait to see what this season brings for us”. Both the girls agreed that one of many misconceptions people make are mistaking competitive cheer for sideline cheer. Misconceptions are all around the world of cheer. These girls are stereotyped with hands on hips and the chants of “Be Aggressive”. Sometimes it just takes going to a competition to realize all of the blood, sweat, and tears that go into this sport. These athletes work just as hard if not even harder than those of other sports.